Holy Family School Board of Management. This project involved the phased renovation of four separate school buildings on one campus. The architect was anxious to preserve the architectural integrity of the existing well designed classrooms dating from the ’60s and ’70s, while upgrading the facilities to those of a modern school. Toilet blocks were installed for each classroom. The existing gold anodised aluminium windows and doors which were single glazed were replaced with matching &quot;Kawneer&quot; sections, thermally broken and double glazed. The existing asphalt roofs were overlaid with tapered insulation and a mineralised reinforced bitumen membrane. Sections of the existing coloured dry-dash were repaired with matching materials. The complete heating systems and electrical systems were replaced. The logistical difficulties of refurbishing a live school were overcome by tackling the works in six phases, while students were accommodated in temporary classrooms provided by us. Services in the &quot;live&quot; school sections were kept operational throughout. 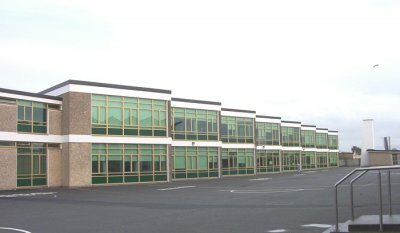 School management were met with on a regular basis to ensure that staff and children had safe use of the designated sections of the school grounds at all times.